LOS ANGELES - Two-time Farmers Classic champion and Southern Californian Sam Querrey, fellow Americans Ryan Harrison and James Blake, France's Nicolas Mahut, Russia's Dmitry Tursunov and Belgium's Xavier Malisse, the tournament's reigning doubles champion, are among the players initially entered in the draw at the 86th annual Farmers Classic, presented by Mercedes-Benz, July 23-29, at the Los Angeles Tennis Center-UCLA. Daily tickets for the Farmers Classic, the longest-running annual professional sporting event in Los Angeles, went on sale to the general public this week and are available at www.FarmersClassic.com, Ticketmaster or by calling (310) 825-2101. The Farmers Classic, presented by Mercedes-Benz, features a 28-player singles and 16-team doubles competition. Los Angeles County's only top-tier pro tennis event and an ATP World Tour stop on the Emirates Airline US Open Series awards total prize money of $700,000. Proceeds from the Farmers Classic, held in conjunction with UCLA, benefit the grassroots programs of the non-profit Southern California Tennis Association (SCTA) and UCLA. In 2011, the tournament and associated special events raised more than $200,000 for the SCTA, the Grammy Foundation and other charities. "This stage of the year is always an exciting time in tennis, with the French Open just completed and Wimbledon and the U.S. hardcourt season just around the corner," Farmers Classic Tournament Director Bob Kramer said. "It's never too early to reserve seats for the Farmers Classic while seating options are plentiful. The LA Tennis Center makes for an intimate and intense fan experience because you are incredibly close to the court and the action. Fans watching Wimbledon in the next few weeks can see many of the same players at the Farmers Classic." Querrey, owner of six ATP singles titles, returns to the Farmers Classic for the first time since winning his second consecutive title at the LA Tennis Center in 2010. Leading up to his return to the Farmers Classic, where his star was born on the ATP Tour, the 24-year-old Querrey reached the semifinals of last weekend's Aegon Championships in London. 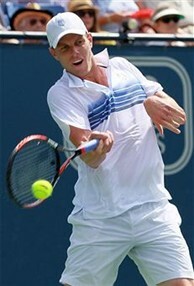 "I'm excited about returning and playing at the Farmers Classic, especially in front of the enthusiastic LA tennis fans at my hometown event," said Querrey, who grew up in Thousand Oaks and resided in Santa Monica the first several years of his career. "The crowds are always great at UCLA, and I look forward to another exciting tournament this year." Ten-time ATP singles winner Blake, once a world No. 4 player, reached the 2007 Farmers Classic final. Seven-time ATP singles champion Tursunov was a Farmers Classic finalist in 2006, and 2012 U.S. Davis Cup player Harrison, 20, was a Farmers Classic semifinalist in 2011 and a 2012 French Open doubles quarterfinalist. Farmers Classic season tickets, mini-plans, group tickets and VIP experiences are also available at www.FarmersClassic.com or by calling (310) 824-1010, ext. 251. The Farmers Classic's group entertainment program includes ticket discounts for groups of 10 or more, fundraising opportunities for organizations and reserved loge seating for select sessions in the intimate LA Tennis Center. Groups of 40 are eligible to participate in VIP experiences, which include the pre-match coin toss, High Five Kids Tunnel and Penn VIP On-Court Experience. Farmers Classic season ticket holders typically keep coming back to soak in the event's history and unique fan experience. "It's always appealing to see professional tennis players up close. That keeps me coming back to seeing tennis' stars," said Phil Flexo, a Los Angeles resident and Farmers Classic season ticket holder since 2002. "When Juan Martin del Potro won the tournament (in 2008), that was an exciting moment. And whenever Andre Agassi would play, that was always exciting for me. I have an assortment of players that I like to see and their style on the court. The stadium allows me to be up close to the players, not only in the actual matches but in the practice sessions. You're almost right there on the court with them as you watch them. You're just about a handshake away." Fans can tap into social media channels to stay updated with the latest news and information surrounding the Farmers Classic, presented by Mercedes-Benz, by becoming a fan on Facebook (www.facebook.com/FarmersClassic) and a follower on Twitter (@FarmersClassic). The Farmers Classic, presented by Mercedes-Benz, has been played every year since 1927, making it the longest-running annual professional sporting event in Los Angeles. Played since 1984 at the LA Tennis Center on the campus of UCLA, the tournament is part of the Emirates Airline US Open Series, the six-week summer tennis season linking 10 ATP World Tour and Sony Ericsson WTA Tour events to the US Open, culminating each week with back-to-back men's and women's finals every Sunday afternoon. Players battle for $40 million, including a chance for bonus prize money at the US Open. Proceeds from the Farmers Classic Presented by Mercedes-Benz benefit the grassroots programs of the non-profit Southern California Tennis Association (SCTA) and UCLA. The SCTA offers programs, leagues and tournaments involving 300,000 juniors and 50,000 adults and seniors. Information on tickets and the tournament can be found at www.farmersclassic.com or by calling 310-824-1010. Farmers is a trade name and may refer to Farmers Group, Inc. or the Farmers Exchanges, as the case may be. Farmers Group, Inc., a management and holding company, along with its subsidiaries, is wholly owned by the Zurich Insurance Group Ltd. The Farmers Exchanges are three reciprocal insurers (Farmers Insurance Exchange, Fire Insurance Exchange and Truck Insurance Exchange), including their subsidiaries and affiliates, owned by their policyholders, and managed by Farmers Group, Inc. and its subsidiaries. For more information about Farmers, visit its website at www.farmers.com or at www.Facebook.com/FarmersInsurance.